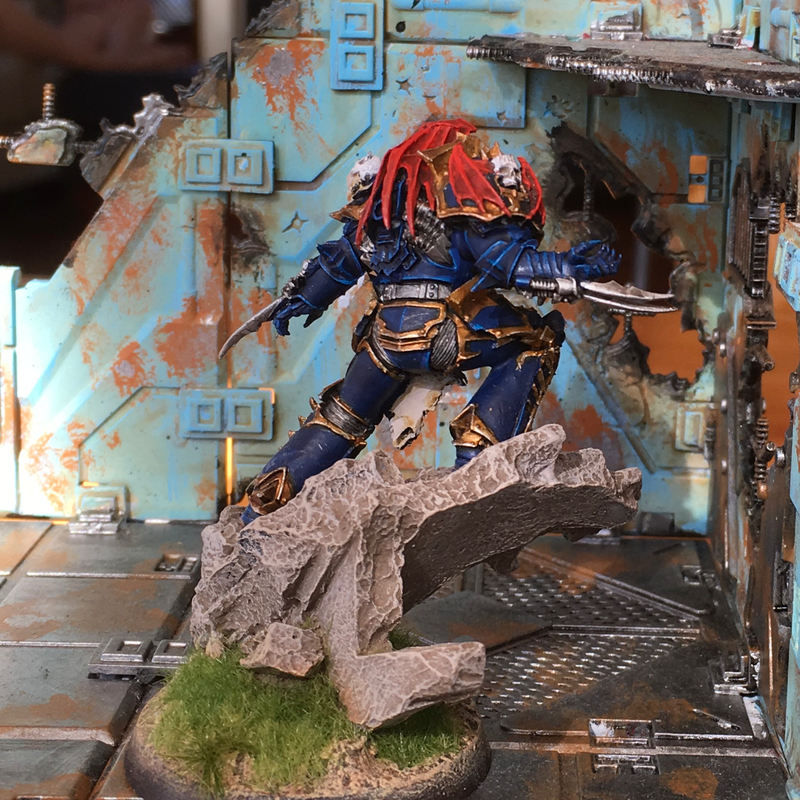 Cancon in Canberra, Australia is the biggest wargaming convention around these parts. 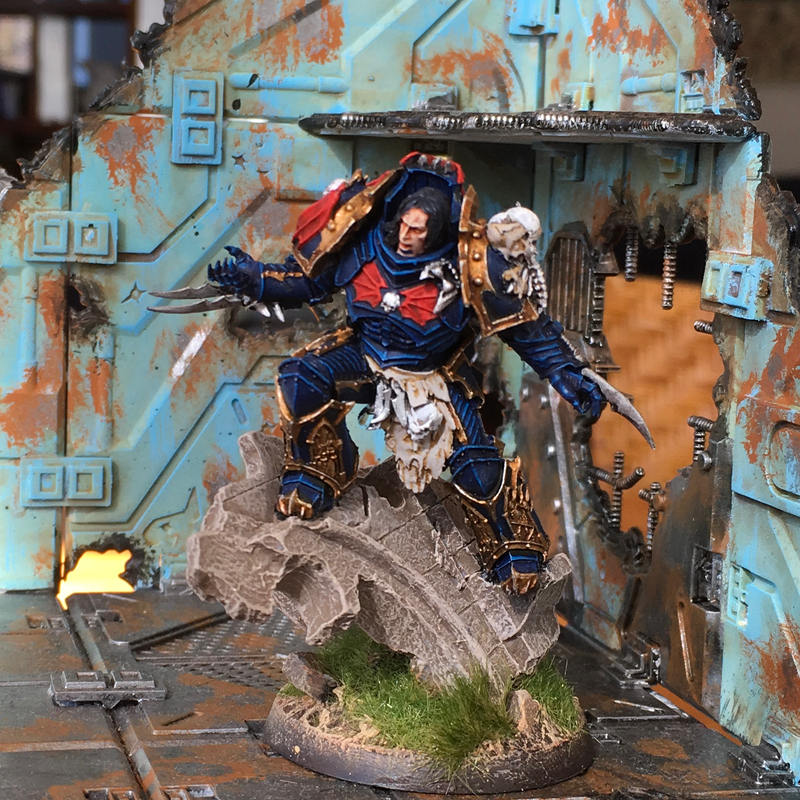 For many years wargaming buddy Craig and von Peter himself have mulled over the idea of a trip to the convention but general inertia had always won the day. Then … Singapore Airlines instituted a direct service between Wellington and Canberra … Singapore Airlines had a sale on said route … The family have visited all around Canberra not not Canberra itself putting Canberra on the second tier bucket list … having heard the Cancan talk over the years/decades Fraulien von Peter herself suggested that a short trip to Canberra coinciding with Cancon might be in order. And so it was organised. And of course wargaming buddy Craig was unavailable to make Cancon due to life issues. D’oh! And before it gets forgotten a big thank you from The family to Canberra wargaming Craig – aka Beresford on at least one forum – and his wife for taking us all out for dinner as our last event in Canberra. Dashedly fine companionship and conversation … and the food was pretty good too … which showed the finest hospitality to strangers one could possibly hope for. We look forward to reciprocating sometime in the future. Back to Cancon. One does not in good faith attend a convention laden with merchandising types without forking out some cash. With The son & heirs assistance – thanks for that help! – von Peter himself kept the faith. We shall meet in Vienna – 1813 in Germany. The Spring Campaign to After the Armistice. The Dear reader will undoubtedly be aware that 1813 in Germany is the sweet spot for von Peter himself and though not cheap – 60 of those United States dollars – the existence of another 1813 scenario book has been needling away at the mind of von Peter himself. And there it was at Cancon. Sold or bought or whatever. For his money von Peter himself has a ring bound document of just over 250 pages with some of those pages being double sized pull out maps. This is a truly ‘meaty’ and weighty in the luggage scenario book. The more well read of the Dear readers will recognise that most of these battles are on the larger side as befits a set of grand tactical rules. Allied map, details on the battle situation, Allied order of battle, recommended tactics and victory conditions for the Allies. Optional / alternate uniform details may also be provided. This is great resource and without wanting to be a knocker front view of parade uniforms are the order of the day and images of saddle cloths for the cavalry are not provided. 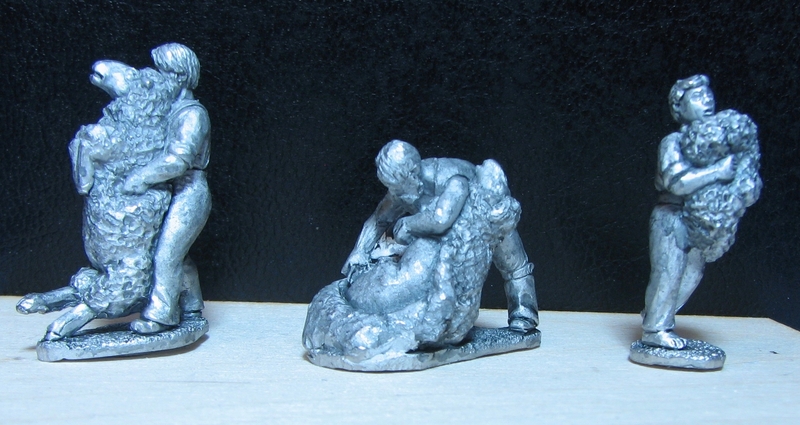 Having said that the images are clearly and cleanly provisioned for the miniature figure painter. The level at which von Peter himself plays his Napoleonic games means he won’t be using these scenarios very often … if ever. But that doesn’t mean that he won’t derive pleasure from studying them. The most expensive Cancon purchase by quite a wide margin. Images borrowed from the Wargaming Company’s website. While in the process of purchasing We shall meet in Vienna the eagle like eyes of The son & heir spotted some dice that utilised Roman Numerals to impart the number rolled. Perfect for a Late Roman army … even if that Late Roman army lies unloved in the unpigmented figure pile. Financial transaction halted and then restarted with the addition of six dice. Dice and scenario book from Olympian Games. This section could be entitled “Beware the Eureka Miniatures stand”. 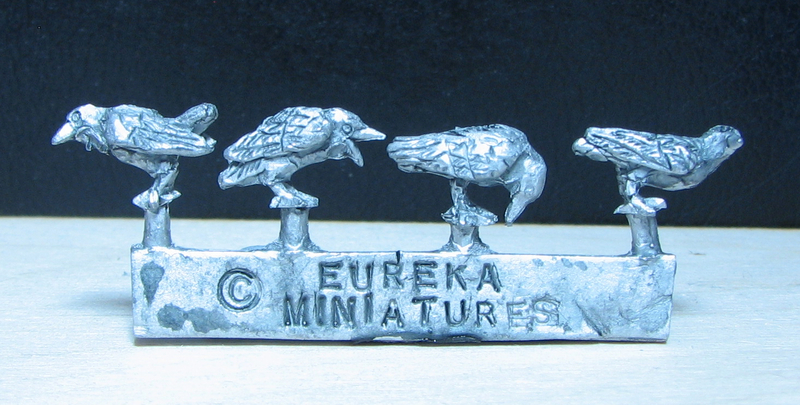 Of course Melbourne’s Eureka Miniatures were present. They have a huge range of temptations but thankfully practicality dictated that they only brought a small sub section of their range for general sale. Compounding this they were stuck in a rather small space apparently the result of some snafu by someone somewhere somehow. Both von Peter himself and The son & heir walked away from the Eureka stand with a plastic bag of mostly animals! Both figured that their acquisitions would be useful as filler or scenery on gaming tables or as the occasional focus of a scenario. As always the amateur photography is care of von Peter himself … with a special artistic blue hue … d’oh! 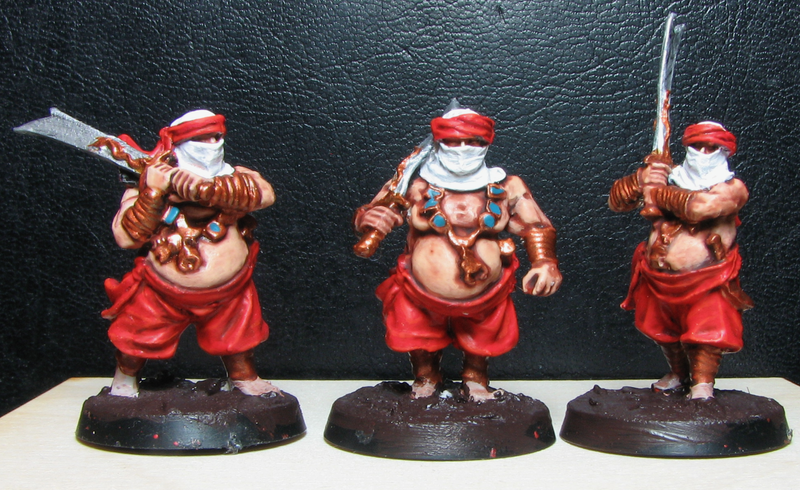 The figures are shown as they were procured from Eureka Miniatures and they have been given a quick dark wash in an attempt to bring out the detail. 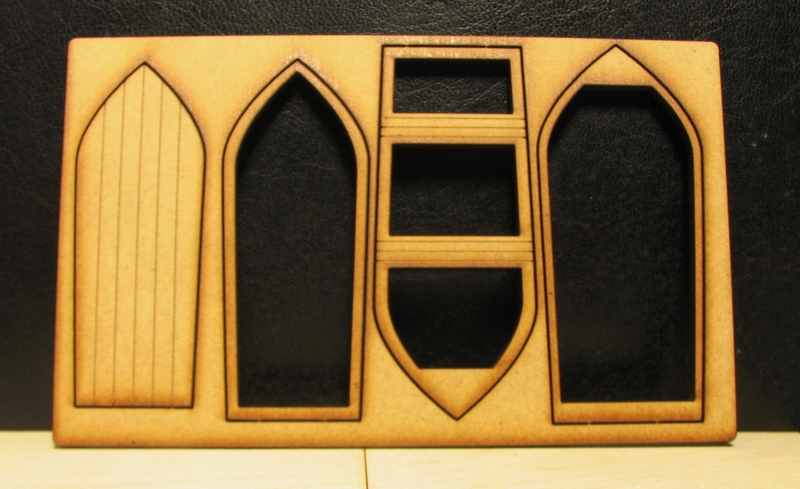 von Peter himself is a bit snooty and is not a huge fan of MDF terrain but his last purchase was a rowboat from Battlefield Accessories … made of MDF. Not expensive and very light when added to the luggage for the trip home. David Brown has provided a walkthrough of his soon to be released Napoleonic General d’Armee Rules. 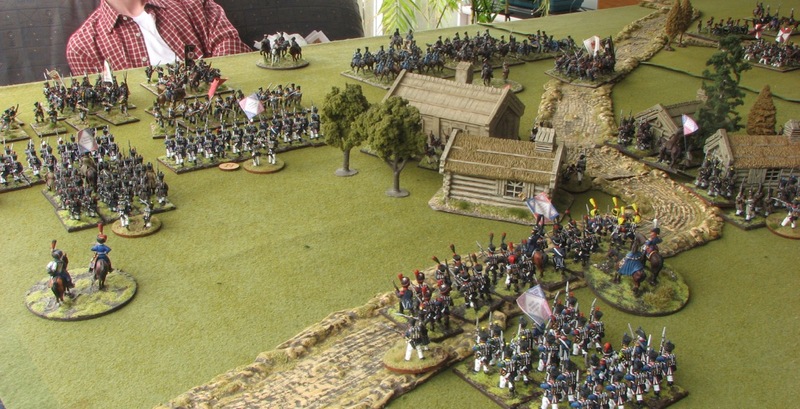 The rules are more akin to Dave’s recently released ACW rule set Pickett’s Charge than his well known General de Brigade Napoleonic rules and apparently provide a faster play and/or larger game solution than GdeB. 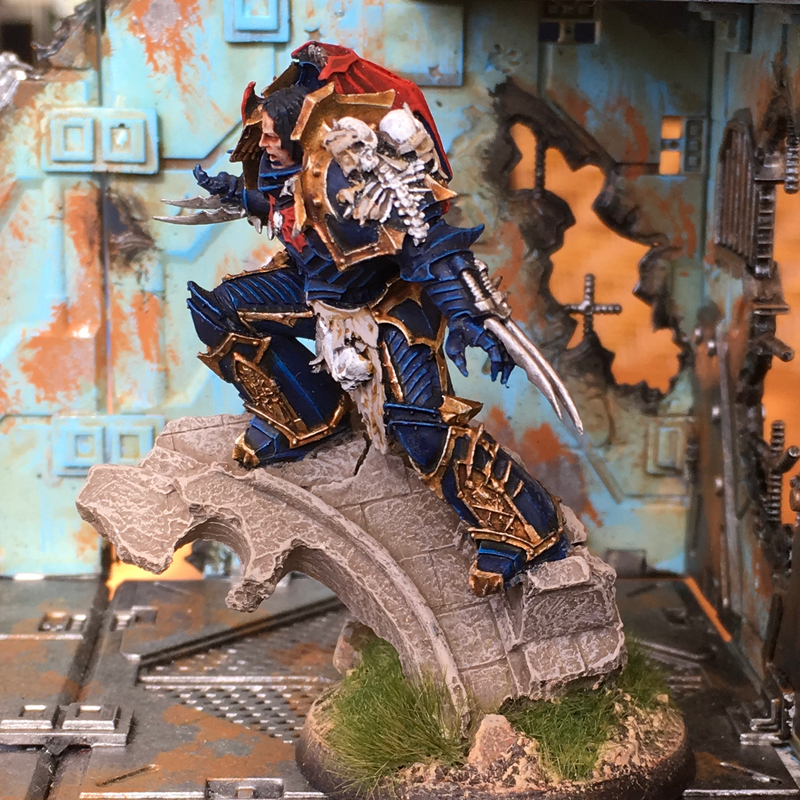 A little more information on the rules can be gleaned on The Miniatures Page here. According to both threads a March/April release date is on the cards. 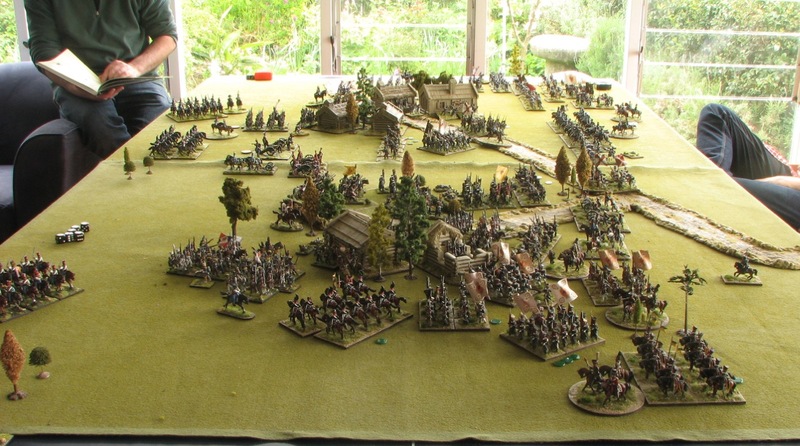 Over the Hills is a fast paced tactical Napoleonic war game designed for any scale and basing system. At is heart are the basic rules, they will allow players to play large games in an evening. The many optional rules provided allow players to flavour their games as much as they want. Finally appendices provide the player with army statistics and scenarios. If you think the rules may be of interest to you you can hear a discussion with one the authors – Adrian McWalter on Meeples and Miniatures episode 196 – Over the Hills. Get it from iTunes etc or direct from Meeples and Miniatures here. Neu Schloss von Peter has been devoid of a live in muttley since the passing of Laelaps. Devoid no longer however. What have we done?! 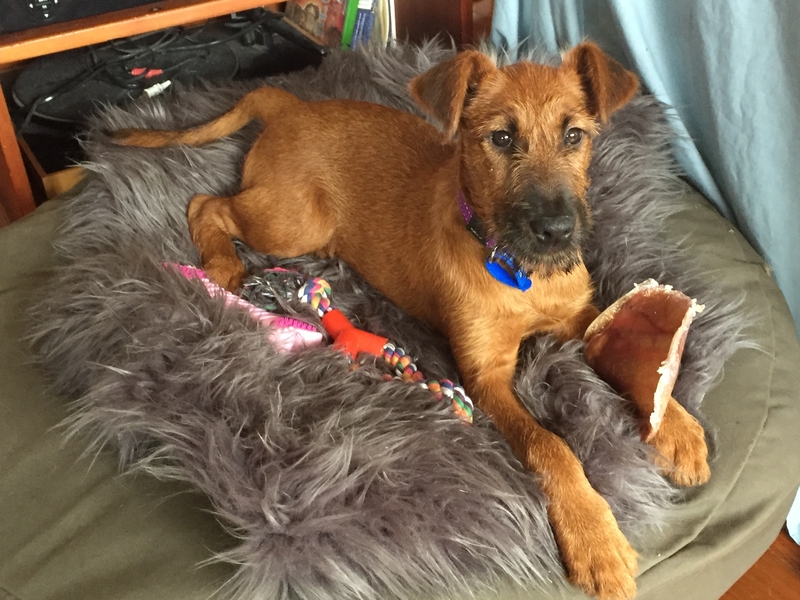 Anyway The family would like to introduce the latest addition to its ranks – Keela the Irish Terrier. Still a puppy but thankfully slowly maturing and learning the rules of engagement around the house. ‘Te Keela’ (pronounced Tequila) as a tongue in cheek Maori version of her name. Thank you Keela. This post took days extra to create thanks to you! Bad doggie!! The son & heir has gotten himself all hot and bothered under the collar reminiscing over his old Warhammer Fantasy Battle Days. So hot and bothered has he got that he has dragged out his Orc & Goblin army and is currently repainting them. Green flesh is out being displaced by a ‘normal’ flesh colour. They are dressed in various tans and off-whites which leads von Peter himself to think that they must be desert Orcs & Goblins. Pictures will follow once he finishes some units which in this case means completes the basing. Above: von Peter himself in the guise of an Empire Captain. This figure is usually used as the Battle Standard Bearer but there is no room for one of them in a 600 point game. This photograph obviously pre the severe chopping up into little pieces delivered by the Black Orc Big Boss. A rather severe reminder as to why pathetic humans should not go forth in the Warhammer Fantasy world without some extra magical protection. The standard was kindly provided by GMB Designs who upon request changed the colours of their Seven Years War Prussian flag of Infantry Regiment 19 to the black and white as seen. The scenario book “Imperial Sunset : The 1813-14 Campaigns” is finally available to order … so von Peter himself has ordered it! 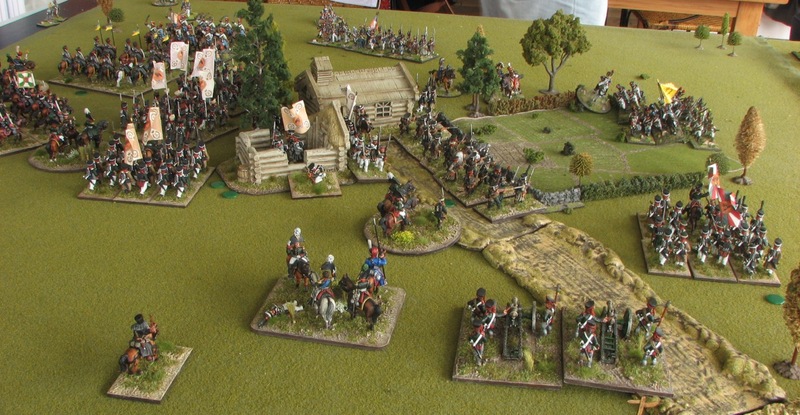 Written for the General de Brigade Napoleonic rules it is not considered a problem to port the scenarios to other rules should the need arise. Besides von Peter himself derives great pleasure just poring over scenario books such as this and 1813 is the sweet spot for von Peter himself. 1. Lutzen: The Prussian Charge. 2. Lutzen: La Garde au Feu! 3. Lutzen: Action at Eisdorf. 6. Kulm: The First Day. 8. Dennewitz – Ney’s Battle. 9. Dennewitz – The Saxon Battle. 10. Leipzig: The Battle for Dolitz. 13. La Rothiere – Marmont’s Flank. 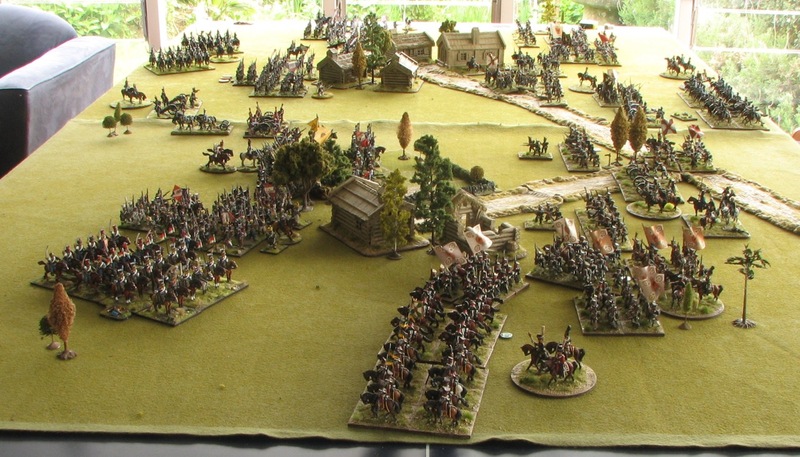 The Lutzen scenarios see Prussians & Russians up against a variety of French and Imperial Guard. All three are linked so can be played together. Bautzen has Wurttemberg troops up against Prussians, while Dresden sees Murat’s conscripts and cuirassiers up against Austrian squares. Kulm has the courageous Vandamme battle the Russian guards, while Hegelberg has an assortment of French and Confederation second line units facing the newly raised Prussian Landwehr. Dennewitz portrays the whole of Ney’s engagement with opposing Prussian forces, before we cover aspects of Leipzig and finally into the 1814 campaign with linked scenarios with Napoleon caught for once without the strategic initiative engaging a powerful allied army of Austrians, Russians and Bavarians. Imperial Sunset is available from Caliver Books for £18.50 plus postage. A l-o-n-g time coming but excellent news all the same. 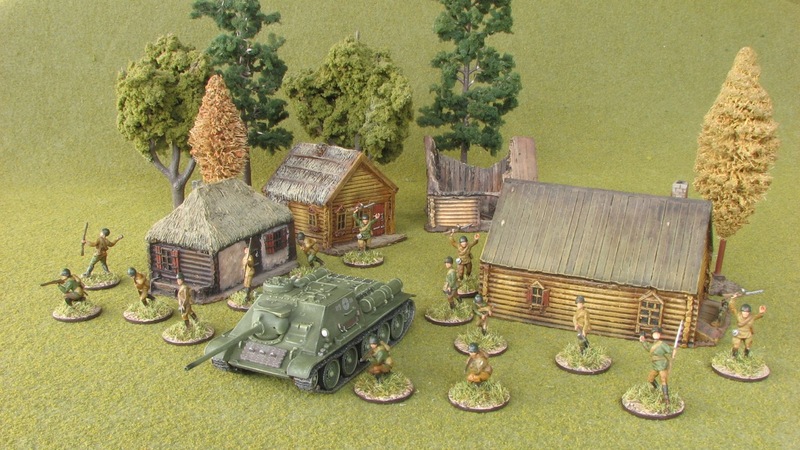 GrandManner have an impressive range of 28mm Eastern Europe buildings and terrain features. Just how impressive a range can be glimpsed by counting the number of Orthodox churches on offer – one, two three, four … five! Collating them all together for the enlightenment of the The dear readers makes von Peter himself feel like he is editing a property magazine! Above: E22 Russian Orthodox Church … or should that be an Orthodox Church? Above: EE99 Borindino Church … or should that be Borodino Church as stated in the description? It does seem rather grand for the Borodino village of the 1812 battle. Church Of The Nativity Of Christ – Borodino, Built 1701- Red Brick- Copper Roof. Large Octagonal Capola And Bell Tower, Covered Steps And Balcony To Upper Floor. Size = Main Body 290X190X450H , Covered Steps = 110X70X120H Total Length = 400. Limited Edition Model = 30 castings, One Per Customer. For Pre 1940 WWII – The Building Is White Washed – Copper Roof. von Peter himself and The son & heir have spent several hours bonding over the BBC series The Last Kingdom. 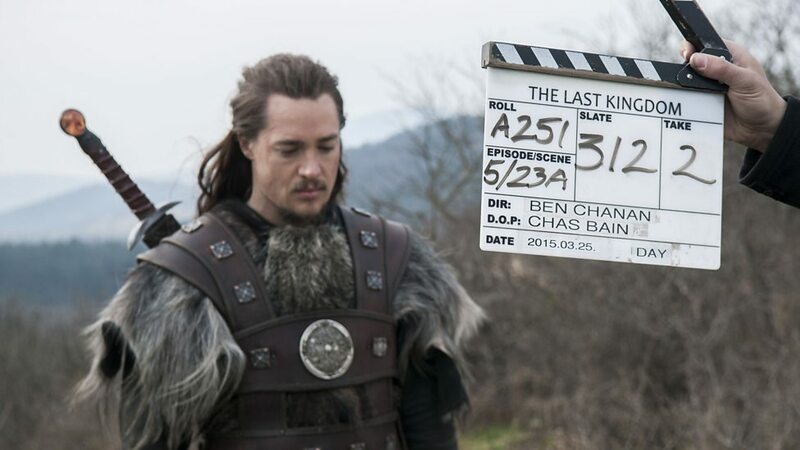 It is based on Bernard Cornwell‘s variously entitled ‘The Warrior Chronicles’ or ‘Saxon Stories’ series of books now renamed for some reason ‘The Last Kingdom’ series. Set in the 9th century of what we now think of as England. Our hero “Uhtred” is born a Saxon, is brought up as a Dane/Viking and then gets to live a confused and eventful life trying to reclaim his birthright … and along the way helping out Alfred, the King of Wessex. If you no not of what von Peter himself types then you will quickly get an idea from The Last Kingdom trailer. And most enjoyable has been the experience for both parties. It is not perfect – eg. there is some suspect imagery so that we do not confuse vikings with Saxons – but overall the series is well made without the often seen obvious scrimping on extras. The story rollicks along and kept the locals keen and coming back for more. Sadly the eight episodes of the first series have been consumed but it appears that a ten episode second series has the “all system go” status so they will be looked forward to. Above: Our hero Uhtred dressed as a Viking but fighting for himself and Alfred the King of Wessex and his Saxons. Thanks to the BBC for the image. And you can learn more about the project at RebelTheSeries.com. 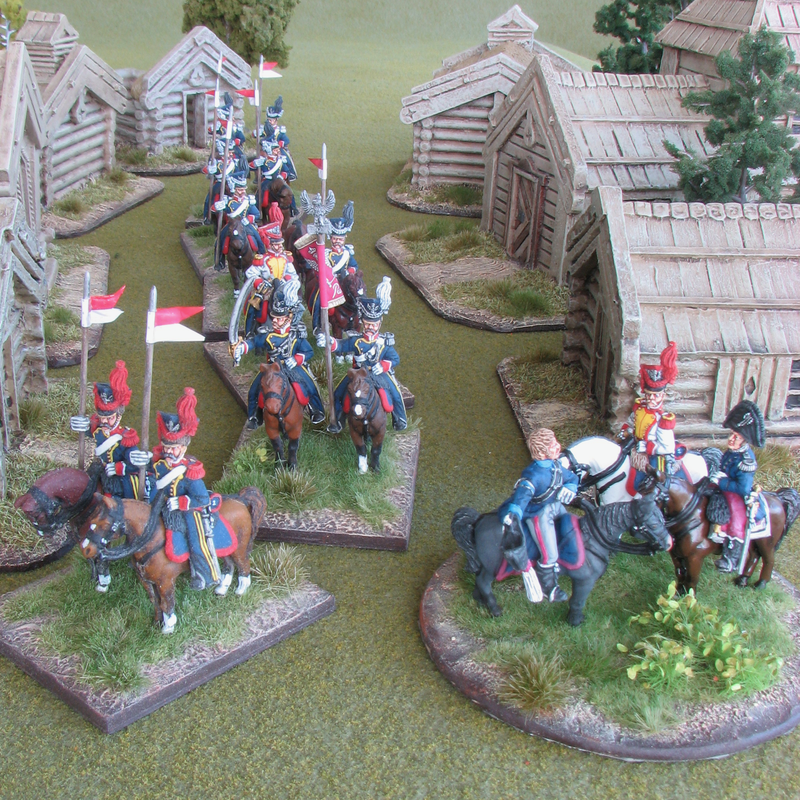 the two horses and their destined riders back left are from the Calpe Miniatures French F18 Regimental headquarters pack. The two dismounted figures from the same pack are finished – hence out of picture – and wondering where their mounted betters are! Once complete all four figures will comprise von Peter’s first Napoleonic French command stand who will for now sit at the apex of the French forces – Bavarians, Saxons and for now a solitary 5 company French battalion. the first eight figures of the Saxon 1/Prinz Frederich August Infantry Regiment. 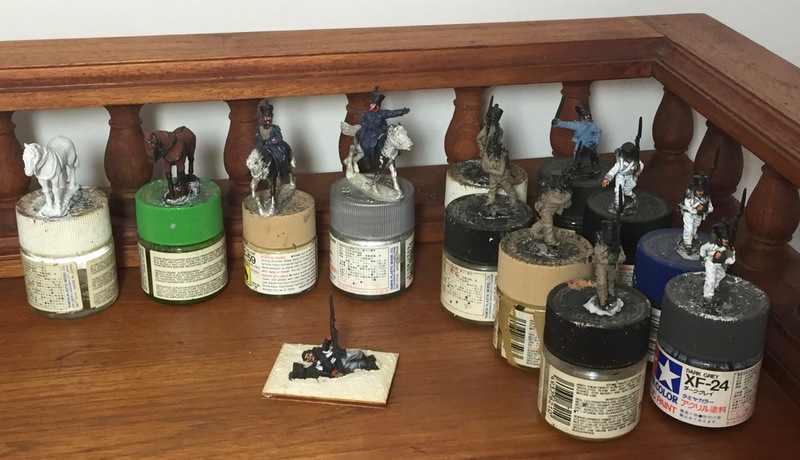 Initially the plan was to paint four figures as a trial of the green faced battalion but the four somehow became eight … and another four have been cleaned up and waiting to go. 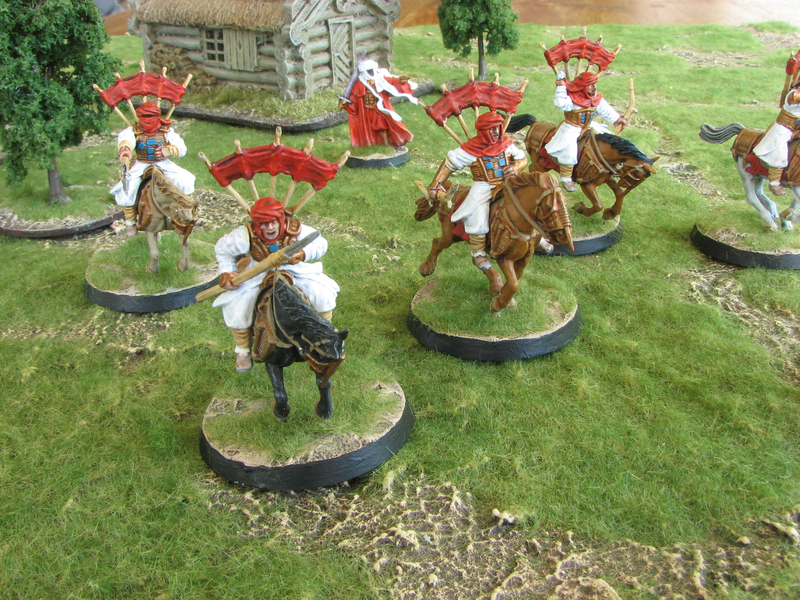 von Peter himself tends to paint his Napoleonics in multiples of four as this is how they are based. Very rarely is a complete battalion painted in one all encompassing batch. This would no doubt be the most efficient manner but von Peter himself does not have there required attention span or mental fortitude so smaller batches are a happier way forward for him. Once again the figures are sourced from Calpe Miniatures but are the older Saxons as found in the Calpe Veterans section of cape’s website. a single Calpe Prussian casualty figure. Many more of these are required as a practical matter for marking casualties in games as required by some rules. The official policy is to paint casualty figures when a new unit is painted but this is a newish policy and there is a bit of ground to make up. Not shown is the Hovels 25mm H3 Russian/Timbered Church which was cleaned up and washed today … and will hopefully be glued together tonight in preparation for pigmentation. Remember that clicking on most images will reveal a larger and clearer image. the buildings were originally created by Scenic Effects for use in 1812 Napoleon invades Russian duties. They are now available from Monday Knight Productions. They are 15mm but these and others are on hand and being of a parsimonious turn von Peter himself plans to use them for the 1/72 WWII Eastern Front action. Pigmentation applied by Craig. pdf copies of the Battlegroup Rule Book and the Battlegroup Kursk have been purchased and for now these are the rules being aimed for. Neu Schloss von Peter had not yet hosted a wargame. Something obviously had to be done so a trip back to late 1812 and the steppes of Russia had to be organised. It had to be Russia as not only had Neu Schloss von Peter not seen any gaming activities but neither had the Russian buildings that von Peter himself had painted! History had to be tweaked a little for the game. The Prussians had left the Bonapartists clutches a little earlier than the history books relate AND managed to get three battalions of East Prussian landwehr raised and sent to the front in north western Russia. The path to the west for two depleted French Divisions keen to leave the distinctly ordinary Russian hospitality was blocked by a joint Russian and Prussian force. Generals de Division Terry and Roly would be looking for a way through the blocking Prussians of Generalmajor Simon and the Russians of Generalmajor von Peter himself. The action would take place in the environs of the little village of Baooshka and an even smaller village that didn’t seem to rate a name. Each of the French Generals provided their own troops as did von Peter himself. Generalmajor Simon used the Prussians of his own creation plus those of von Peter himself. Black Powder were the rules of the day. Conveniently General de Division Terry was well versed in their use and the local modifications. He would be a busy man! Having lost his dedicated large gaming bedroom – The Bastion – with the move from Schloss von Peter games are now to be played in the sunroom or lounge or the double garage as best befits the occasion. For this first game the sunroom was the room of choice so the table was moved to make way for the gaming table tennis table. Sadly taking pictures in the sunroom was a little problematic especially as it was sunny and it was physically impossible to photograph the table from some directions … unless one were to go outside and take the photographs through the glass!! Let the dance begin. The calm before the storm. The end game from the Prussian wing of the battle as seen from behind the French. Renowned beau sabre General de Division Terry has not yet used his Wurttemburg cavalry brigade which hovers in the rear of the French lines (out of picture). Likewise the Prussian cavalry is playing the cat and mouse game towards the rear of the Prussian lines. The Prussians have slowly been worn down but are still full of fight. Much was the muttering from the Prussian commander about getting his landwehr troops to do as they were instructed. The same scene from the Prussian lines. It was noticeable during the battle that Generalmajor Simon was much harder on those East Prussian troops supplied by von Peter himself than their Silesian compatriots that were supplied by Generalmajor Simon. Very interesting! The game seemed to be enjoyed – apart from The son & heirs problems with the recalcitrant landwehr! Most importantly the Battle of Babooshka got the right result with the Bonapartists getting a good kicking thanks to Father Disputin’s encouragement and threats of eternal damnation should the French be victorious! 😃 Father Disputin’s rantings preaching most certainly worked wonders on the dice as rolled by von Peter himself some of which was outrageous. Sorry Roly … no honestly! Another outcome of the game is that von Peter himself is reminded that there are still two Russian buildings to be painted. And one of those two buildings is an Orthodox church. Father Disputin will not be happy should the church remain unpigmented for too long! We are happy to announce Battle in a Box! We have been keeping this under our hats for some time but we are getting close to the release now. As you can see this is a full box! It’s a big box too! Everything in the box is plastic, figures and terrain (from Renedra Ltd). 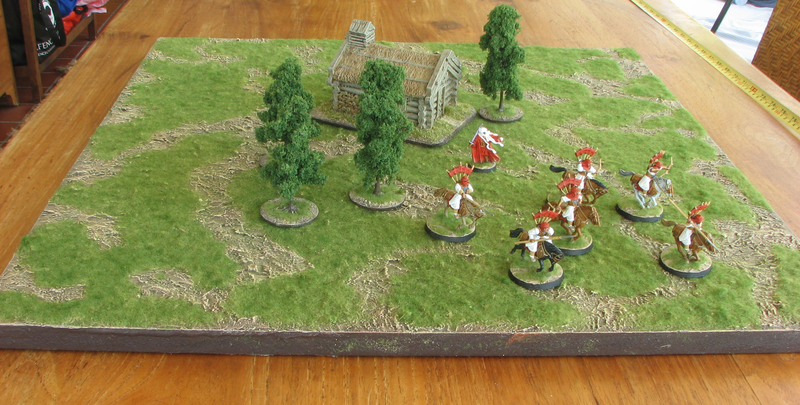 Included in the box there is a new ACW multi-part General sprue (x2) made by Michael. 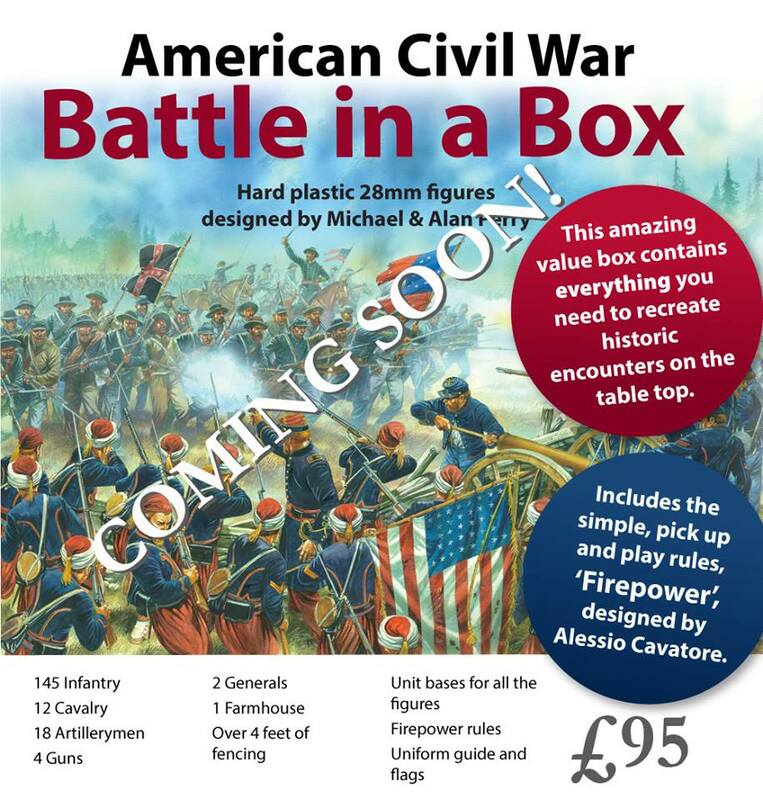 There’s also a revised set of ‘Firepower’ rules by our good mate Alessio Cavatore included along with flags, bases, painting guide, 4 ft of fencing and the American farmhouse. The box cover was by that talented artist Peter Dennis. The whole box works out at about a third off our normal prices. 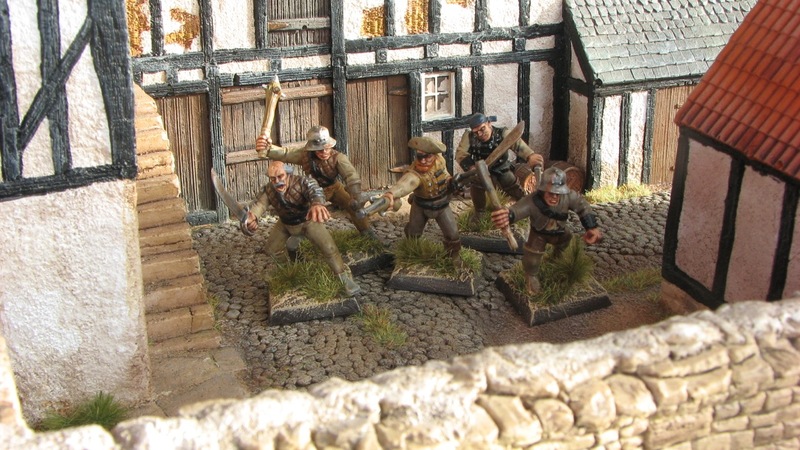 von Peter himself and The son & heir probably have enough ACW to be getting on with – especially as the ACW project seems to be dormant for now. But for someone starting out on their their ACW journey this Battle in a Box could be a great start. Then again 95 pounds is not an insignificant up fromt cost. and a shed load – because there are so many figures in the above boxes – of shield decals. To be honest only the savings on the decals would have been accrued. The two boxes of figures were sourced from Caliver Books as not only were the boxes a little cheaper but postage was free. With the cost of postage from the UK to NZ von Peter himself does not feel so aggrieved about missing the sale. We are running a “30% off all orders” deal from today until Sunday 18th October. This applies to all our product range including shield transfers and flags. Just type in 30%off in the discount box at the check out stage of the shopping cart. After six months of testing and a system upgrade digital downloads are now finally available. Thank you Natalie for all your hard work, and to the many friends worldwide for testing the e-mail links for us. From 5 October 2015 an additional delivery option will be available for the ‘Armies and Uniforms of the Napoleonic Wars’ series of e-Books by W J Rawkins. Customers will now be able to order these books as a downloadable PDF file simply by selecting the DIGITAL DOWNLOAD option at the checkout. The package for online download will consist of the Book File, plus a printable sheet of disc labels and artwork for a DVD case cover for those customers who wish to create a back-up disc. The download link will be sent by e-mail to the address provided by PayPal at confirmation of payment usually within 2 hours and will be available for 48 hours during which period the files may be downloaded no more than three times. The option of buying the books loaded to DVD-Rom will still be available and postal charges will be subject to current Royal Mail rates and policies. MAC USERS: Older MAC users (Not you McKenzie) may experience some issues if they have not upgraded to accept PC generated files. Please contact us if in doubt. Enough. And don’t forget that you can click on the images for a larger and clearer version.